Lord Shiva, as we all know, is one of the most important characters in the Holy Trinity. Shiva is known as the transformer and the destroyer. Despite being so calm and of meditative nature, he is one of the most feared gods of Hinduism. Looking at Lord Shiva paintings, you will find that he has a third eye. The myth that if he gets angry anyway, then he will open his third eye and will destroy the whole universe, makes him the most feared one. But people have misunderstood the concept. The reality is that more than a destroyer, he is a creator and a transformer. If he destroys something, then it’s the negative energy which, later, results into a beautiful creation. The negative energies that he destroys are our ego, attachment with the worldly entities, desires, illusions, ignorance and everything else that distracts us and acts as an obstacle in the path of spiritual progress. Lord Shiva kills our emotions, effects of bad karma, impurities, and attachments so that we can transform our inner self and can turn into a perfect being. Lord Shiva paintings canvas show the three lines of ash on his forehead, which is believed to be the destruction of the three worlds. We have heard a lot of stories about him and his wife Parvati (also known as Shakti). We know that Shiva has a lot of avatars, but only a few of us is aware that Hanuman, the son of Anjana and Kesari, too, was his avatar. Shiva is the most prominent among the Trinity because he was entirely disconnected from the outer world. He was free from any worldly desire, and nobody was ever able to allure him with any greed. For him, the world resided within himself. And, therefore, he spent most of his time meditating and performing Tandav. But, are we aware of his origin? From where did he come? Who gave him birth? Who is his mother? How was he born? I am pretty sure that a very few of us knows the answer correctly. The story of Shiva's birth is quite interesting, and I am sure, you, too, will find it the same way. Once Brahma and Vishnu were fighting and arguing about who is superior among them and who is more powerful? The argument continued because each of them claimed themselves as the most powerful one and wanted the other to worship him. In the midst of their heated argument, a perplexingly blazing pillar appeared in front of them. The pillar's root and end were not visible. It seemed as if the roots penetrated in the ground and its apex pierced in the sky. So they stopped their debate in the mid and planned to find out the end. Both Brahma and Vishnu had a deal that whoever finds the end first, will be the superior one and the other will worship him, then they both left. Brahma turned into a goose and flew away, while Vishnu turned into a boar and started digging into the ground. Hundreds and thousands of years passed but none of them was able to find the end. Ultimately, both of them thought to return to the same place from where they started. Brahma, during his journey, met a flower named Ketaki. Brahma thought to take Ketaki as an evidence and will say that he found the end. When he returned, he lied to Vishnu that he saw the end of the pillar and Ketaki too agreed with the same. The very moment pillar broke, and Shiva manifested into a body. Shiva scolded Brahma for lying and cursed him that he will never be worshiped. Along with, he also cursed the flower Ketaki that nobody will ever use it for any religious or sacred purpose. And, at the very moment, both Brahma and Vishnu realized that Shiva is the one who is the most powerful and that his cosmic existence is much beyond their understanding. After Sati's death, he was broken and unable to come out. Therefore, Lord Shiva went into his ascetic self and remained in for a very long time. After some time, Sati reincarnated as Parvati and approached him for marriage. But Shiva didn't open his eyes. So, Lord Vishnu asked Kamadev to awaken him by instilling the love-desire within him. And therefore, Kamadev shot love arrows at Shiva. Disturbed and awaken by this, Shiva got furious, opened his third eye and burnt Kamadev into ashes. It shows that Shiva had an ultimate control over his mind. Nobody was ever able to create any desire within him. 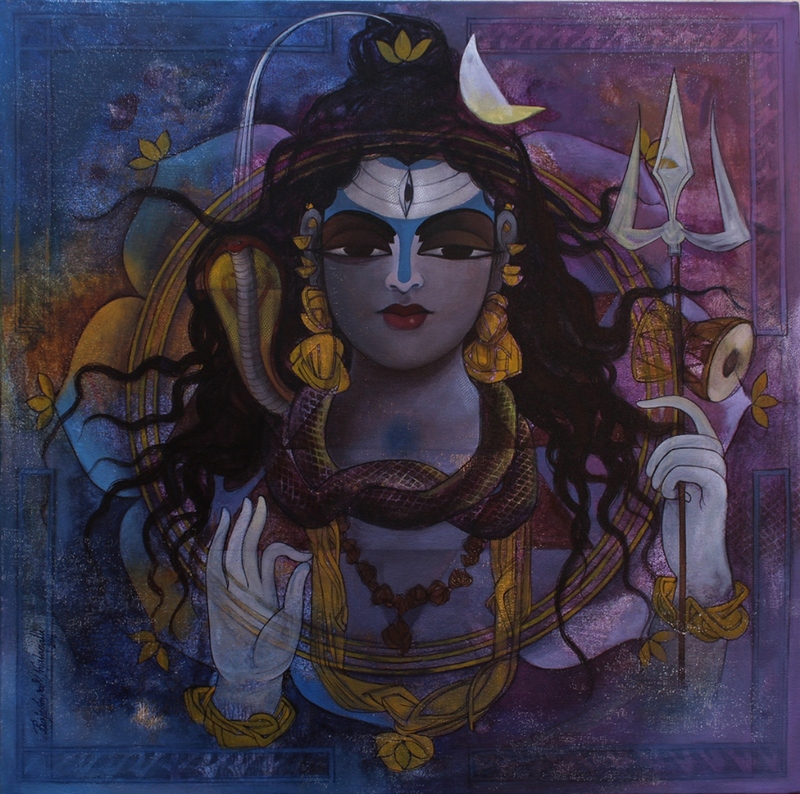 Lord Shiva paintings describe his conduct, the way he used to live. With snake coiled around his neck, Trident (Trishul) in one hand, covered with animal skin, sitting on the crematory ground and ashes, he is a unique personality of all.